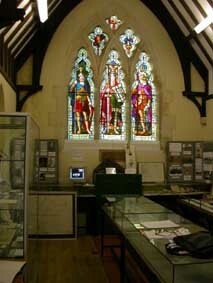 Ash Museum is in the Cemetery Chapel, Ash Cemetery, Ash Church Road, Ash. We are open 3rd Sunday each month 2.00pm - 4.30pm. This hand pulled funeral bier, which continued in use until c.1977, forms a central exhibit in the museum. Other interesting objects include three shields which formerly hung in the British Legion Hut next to the Ash War Memorial, saved when the hut was demolished, a souvenir programme for the presentation of the Victoria Hall clock and turret by Dr Henry Morris Chester in memory of his mother, the trowel used to lay the foundation stone of the Victoria Hall, and Mr Wren's Burial Board Notice Board. A Lucas 260N “King of the Road” carbide cycle lamp made by Joseph Lucas Ltd of Birmingham forms part of a display of memorabilia from the very well known Tolley's Garage. A plan of Ash Cemetery in 1887 is also on display. In 1943 Italian Prisoners of War were kept at Carfax Avenue, and on display we have the Crucifix in the Bottle made by POW Annunziata Alfonso in 1944. You can also see a painting of St Peter’s Church c.1906 by John James Miles who spent his whole working life as school master in Ash at Ash National School and then at Heathcote Memorial School; and from Tongham School we have collection of Tongham Trophies. Ash Common School was founded in 1860 and renamed renamed Heathcote Memorial School in memory of the Reverend Gilbert Wall Heathcote, Rector of Ash 1838 to 1884, who died in 1893. Our display includes copies from the log books, the 1860 foundation stone and a rainwater head dated 1884 commemorating the building of the first extension to the school. There is a large and growing collection of old pictures of village buildings and people to browse through and bring back memories. 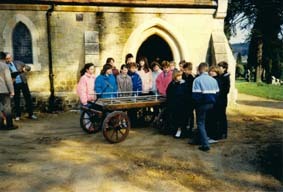 There are folders of Tongham Stories and memories of the Ash Through the Ages Group of the Ash U3A to read, Ash Museum Newsletters and History Notes produced by Ash Museum on a range of topics. Visitors can also watch a delightful Film of Country Dancing at Dene Lodge c.1928.